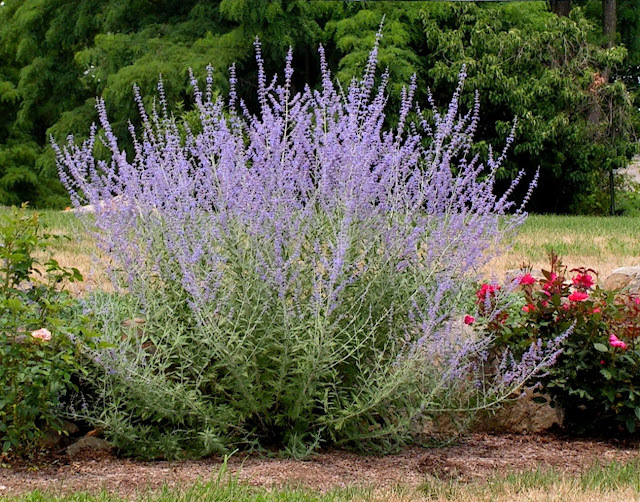 Description: With its tall wispy wands of lavender or blue flowers and silvery foliage, Russian sage is an important player in summer and fall gardens. It shows off well against most flowers and provides an elegant look to flower borders. The aromatic leaves are oblong, deeply cut along the edges. Foot-long panicles of flowers bloom for many weeks. Excellent drainage and full sun are ideal, although very light shade is tolerated. Plant close to avoid staking since the tall plants tend to flop. Uses: Containers,Beds & Borders,Privacy. Excellent for neglected areas, such as roadside plantings where the sprinklers won’t reach. Also sets a nice cooling backdrop for bright warm colored flowers, especially reds and orange. Tips: ‘Filigran’ is the hardiest, to zone 3. Rabbits and deer don’t care for Russian Sage, but bees love it. Spreads by seed and underground runners. Cut plant back to the ground sometime between late fall and early spring.